The grouping together of thinkers that would eventually be dubbed “Fa-Jia” or “Legalists” can be traced to Han Fei (280–236 BC). On rare occasion Han Fei lauds such qualities as benevolence and proper social norms. Written around 240 BC, the Han Feizi is commonly thought of as the greatest of all “Legalist” texts, bringing together his predecessors’ ideas into a coherent ideology. They attracted the attention of the First Emperor, and are believed to contain the first commentaries on the Tao te Ching in history. It is often said that succeeding emperors followed the template set by Han Fei. This following article is from “Legalism in Chinese Philosophy” by Yuri Pine in the archives of the Stanford Encyclopedia of Philosophy. The term “Legalist school” (fa jia 法家) is ubiquitous in studies of early Chinese political philosophy. Despite manifold criticisms of its inaccuracy (e.g., Goldin 2011), the term may still be usefully employed, as long as two major points are taken into account. First, Legalists were not a self-aware and organized intellectual current; rather the name was coined as a post-factum categorization of certain thinkers and texts, and its primary function before the twentieth century was that of a bibliographical category in imperial libraries. Therefore, the identification of any thinker or text as “Legalist” will forever remain arbitrary; the term may be used as a heuristic convention but should not be employed (pace Creel 1974) as an analytical device. Second, “Legalism” is a problematic name. The Chinese term fa jia is already misleading, because it inadvertently reduces the rich intellectual content of this current to a single keyword, fa. “Legalism” is a doubly misleading English translation, because the semantic field of the term fa 法 is much broader than “law”; it refers also to methods, standards, impersonal regulations and the like (Creel 1974: 147–149; Goldin 2011). It is incongruent, then, to discuss the fa jia within the context of the Occidental notion of “the rule of law,” as was popular in early modern Chinese scholarship (e.g., Hsiao 1979: 442–446) and as is sometimes done even nowadays (Fu Zhengyuan 1996: 158–161). If these intrinsic inaccuracies of the term “Legalism” are borne in mind, it can be employed—as in what follows—merely for heuristic convenience. The term is simply so widespread in scholarly literature that replacing it with a new designation will just further confuse the readers. While the term “Legalism” was coined only during the Han 漢dynasty (206 BCE-220 CE), its roots—or more precisely the idea of grouping together several thinkers who will be eventually dubbed “Legalists”—can be traced already to Han Fei 韓非 (d. 233 BCE), who is often considered the most significant representative of this intellectual current. In chapter 43, “Defining the Standards” (“Ding fa” 定法) of Han Feizi 韓非子, the thinker presents himself as a synthesizer and improver of the ideas of two of his predecessors, Shang Yang 商鞅 (d. 338 BCE) and Shen Buhai 申不害 (d. 337 BCE) (Han Feizi 43: 397–400). Pairing Shen Buhai and Shang Yang, and adding Han Fei himself to them became common from the early Han dynasty (see, e.g. Huainanzi 6: 230; 11:423; 20: 833). The historian Sima Qian 司馬遷 (ca. 145–90 BCE) identified these three thinkers as adherents of the teaching of “performance and title” (xing ming 刑名) (Shiji 62: 2146; 68: 2227; translation borrowed from Goldin 2013: 8). This term was synonymous to the later fa jia (Creel 1974: 140). The first to use the term fa jia was Sima Qian’s father, Sima Tan 司馬談 (d. 110 BCE). In an essay on the “essence of the six schools of thought,” Sima Tan notices that fa jia are “strict and have little kindness,” and “do not distinguish between kin and stranger, nor differentiate between noble and base: everything is determined by the standard (or law, fa).” Sima Tan criticized the Legalists’ approach as “a one-time policy that could not be constantly applied,” but also hailed the fa jia for “honoring rulers and derogating subjects, and clearly distinguishing offices so that no one can overstep [his responsibilities]” (Shiji 130: 3289–3291; for translations cf. Smith 2003: 141; Goldin 2011: 89). A century later the bibliographical category of fa jia was created. The Han librarian Liu Xiang 劉向 (77–6 BCE) identified ten texts in the Han imperial library as belonging to fa jia (Han shu 30: 1735). Thenceforth “Legalist school” remained a major category of imperial book catalogues. Since the early 20th century this term has come to be widely used for classification and analysis of early Chinese thought. Of the ten “Legalist” texts in the Han imperial catalogue, six ceased circulating more than a millennium ago; two arrived at our days relatively intact, and of two others only a few fragments survived vicissitudes of time. The earliest (in terms of its composition) surviving text is the Book of Lord Shang (Shang jun shu 商君書), attributed to Shang Yang (aka Gongsun Yang 公孫鞅 or Lord Shang 商君), a major reformer who orchestrated the rise of the state of Qin 秦 to the position of a leading power of the Chinese world. In the process of transmission, the book lost at least three chapters; a few others had been badly damaged, becoming barely legible. Since the late 18th century efforts have been made to prepare a critical edition of the text and amend its corrupted parts; yet more than two centuries passed before the comprehensive critical edition was published (Zhang Jue 2012). The text is highly heterogeneous in terms of its composition: some chapters were almost certainly penned by Shang Yang himself; others may come from the hand of his immediate disciples and followers, but a few other were written decades and even more than a century after his death. This said, the text presents a relatively coherent ideological vision, and it is likely that it reflects intellectual evolution of what Zheng Liangshu (1989) dubbed Shang Yang’s “intellectual current” (xuepai 學派). The second surviving text, Han Feizi 韓非子, is attributed to Han Fei, a scion of the ruling family from the state of Hán 韓 (not to be confused with the Hàn 漢 dynasty), a tragic figure who was allegedly killed in the custody of the King of Qin, whom Han Fei wanted to serve. Of all Legalist texts in the Han imperial catalogue, the Han Feizi fared the best over the vicissitudes of time: all of its 55 chapters attested in the Han catalog are still intact. The issue of whether or not the entire book had been penned by Han Fei is debatable: considerable differences among the chapters in terms of style and mode of argumentation lead not a few scholars to suspect that they come from different authors. On the other hand, the differences may be explained as reflecting the process of Han Fei’s intellectual maturation, or the need to adapt argumentation to different audiences; and since most of the chapters present a coherent outlook, it increases the likelihood that most of them were indeed written by Han Fei (Goldin 2013). Overall, the Han Feizi is considered as philosophically and literally more engaging than the Book of Lord Shang, and it has been more widely studied in China, Japan, and in the West. Two other Legalist texts mentioned in the Han imperial catalog did not survive intact, but lengthy quotations from them in the imperial encyclopedia have allowed partial reconstruction of their content. 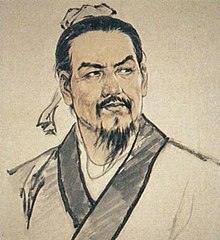 Shēnzi 申子 is attributed to Shen Buhai, who acted as a chancellor of the state of Hán 韓 in the middle fourth century BCE, and who is credited with major administrative improvement there. Of the original six chapters fewer than three dozen fragments remain intact (Creel 1974). Another text, Shènzi 慎子 is attributed to Shen Dao 慎到 (fl. ca. 300 BCE), of whom very little is known (it is even possible that the figure of Shen Dao a is conflation of several personalities; see Xu Fuhong 2013: 2–8). Of original 42 chapters, seven survived (albeit in an incomplete form) in a seventh-century CE encyclopedy; altogether over 120 surviving fragments of the text are considered authentic (Thompson 1979; cf. Xu Fuhong 2013). In what follows, to avoid confusion betweenShēnzi and Shènzi, they will be referred to as works of Shen Buhai and Shen Dao respectively. The above four texts are the major repository of Legalist ideology. Several other texts appear to be closely related to these in terms of ideological outlook and vocabulary: of particular importance for discussing Legalism are several chapters of a heterogeneous miscellany, Guanzi 管子, which is nominally attributed to another major reformer, Guan Zhong 管仲 (d. 645 BCE) from the state of Qi 齊, but which was in reality produced between the fourth and the second centuries BCE. Of further relevance for understanding Legalist thought are a few segments of another multi-authored compilation, the Lüshi chunqiu 呂氏春秋 (ca. 240 BCE), and memorials of the man who is considered the architect of the Qin 秦 Empire (221–207 BCE), Li Si 李斯 (d. 208 BCE) (for Li Si, see Bodde 1938). In addition, many more texts and thinkers are at times identified by scholars as “Legalist”; but since most of these identifications are quite arbitrary they will not be considered in the framework of the current discussion. Legalism is just one of the many intellectual currents that flourished in China during the three centuries prior to the imperial unification of 221 BCE. This period, often identified as the age of the “Hundred Schools” was exceptionally rich in terms of political thought. The outburst of interest in political issues was not accidental: it took place against the backdrop of a severe systemic crisis. The end of the Springs-and-Autumns period (Chunqiu 春秋, 770–453 BCE) was marked by the progressive disintegration of political structures in the Zhou 周 realm (the then Chinese world). Gradually, the Zhou world became entangled in a web of debilitating struggles among rival polities, between powerful nobles and the lords within each polity, as well as among aristocratic lineages and among rival branches within major lineages. By the fourth century BCE, a degree of re-centralization in individual polities was achieved, but interstate warfare further intensified, giving, in retrospect, the new era an ominous name: the age of the Warring States (Zhanguo 戰國, 453–221 BCE). As wars became ever bloodier and more devastating, and with no adequate diplomatic means to settle the conflicts in sight, most thinkers and statesmen came to an understanding that unity of “All-under-Heaven” (tianxia 天下) was the only means to attain peace and stability (Pines 2000). How to bring this unity about and how to “stabilize All-under-Heaven” became the central topic addressed by competing thinkers. In the final account, the Legalists’ ability to provide the most compelling answers to this question became the singular source of their ideological appeal. Crises and bloodshed aside, the Warring States period was also an age rife with opportunities for intellectually active individuals. It was an exceptionally dynamic period, marked by novel departures and profound changes in all walks of life. Politically, the loose aristocratic entities of the Springs-and-Autumns period were replaced by centralized and bureaucratized territorial states (Lewis 1999). Economically, the introduction of iron utensils (Wagner 1993) revolutionized agriculture, allowing higher yields, prompting the development of wastelands, and bringing about demographic growth, as well as accelerating urbanization and commercialization of the economy. Militarily, new technologies, such as the crossbow, as well as new forms of military organization, brought about the replacement of aristocratic chariot-led armies by mass infantry armies staffed by peasant conscripts, resulting in a radical increase in warfare’s scale and complexity (Lewis 1999). And socially, the hereditary aristocracy that dominated the Zhou world during much of the Bronze Age (ca. 1500–400 BCE) was eclipsed by a much broader stratum of shi 士 (sometimes translated as “men of service”), who owed their position primarily to their abilities rather than their pedigree (Pines 2013c). These profound changes required new approaches to a variety of administrative, economic, military, social, and ethical issues: old truths had to be reconsidered or reinterpreted. For intellectuals eager to tackle a variety of new questions—and particularly for the Legalists—this was a golden age. Each of the competing “schools of thought” sought ways to improve the functioning of the state, to attain sociopolitical stability, and to bring about peace under Heaven; yet among a variety of answers those provided by the Legalists appear to be most practical. This is not incidental: after all, some of the major Legalist thinkers, most notably Shang Yang, were the leading reformers of their age. Legalist thinkers were at the forefront of administrative and sociopolitical innovation; they were the most ready to dispense with bygone norms and paradigms; and they were more pragmatic and result-oriented than most of their ideological rivals. On the other hand, their dismissive attitude toward traditional culture and toward moralizing discourse, as well as their highly critical stance toward other members of educated elite, and their pronounced anti-ministerial approach, earned them considerable enmity. In the long term, Sima Tan’s observation seems correct: the Legalists’ recipes were highly effective in the short run but were much less attractive in the long term.